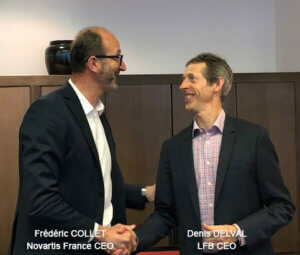 Les Ulis (France), 1st April 2019 – LFB announces the completion of the sale of CELLforCURE to Novartis. A wholly-owned LFB subsidiary, CELLforCURE is a bioproduction facility that is well known for its expertise in producing cell and gene therapy drugs for other pharmaceutical companies. This industrial platform dedicated entirely to cell and gene therapies for other companies does not fit into LFB’s new strategic plan, which involves in particular focusing on plasma and recombinant proteins. The sale to Novartis will leverage the production expertise of CELLforCURE in France. CELLforCURE is expected to provide Novartis with additional CAR-T cell therapy manufacturing capacity and will become a wholly owned Novartis manufacturing site, joining its network of current and planned cell and gene therapy manufacturing sites. Denis Delval, LFB CEO, stated: “the sale of CELLforCURE to Novartis falls in line with our strategy to refocus on our core business – medicinal products derived from plasma or recombinant proteins. We are delighted this manufacturing facility is being taken over by Novartis, which will enable it in particular to continue to invest in the bioproduction of CAR-T cells for patients in France and overseas.